Boil potatoes until done. DO NOT OVER COOK. Slice potatoes into ¼ inch slices from end to end and place in a large bowl. Whip the cream to a soft, firm consistency and blend well with the Miracle Whip. Gently fold whipped cream and Miracle Whip mix into potatoes and onion rings breaking potatoes as little as possible. Add salt to taste as it goes. Cover and refrigerate. 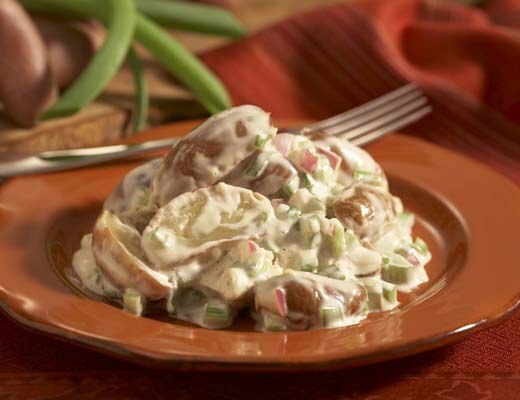 This dish gets better overnight as the onion seeps into potatoes and creamy dressing. Makes a bunch! Peggy’s kids can’t get enough of it!